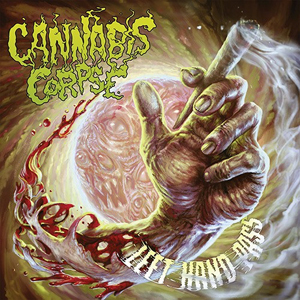 Richmond, Virginia-based death metallers, CANNABIS CORPSE, have revealed that their new album, Left Hand Pass, will be released on September 8th via Season Of Mist. A track from the new album, “Chronic Breed” is streaming below. Turning a classic album title such as ENTOMBED’s Left Hand Path into a weedy phrase would normally be punishable by having to listen to the worst of Kenny G on continued play. Yet CANNABIS CORPSE not only get away with it, but the death metal and pot aficionados are actually doing exactly what their massive following is happily demanding of the Americans. CANNABIS CORPSE are doing once again what they are best at and hammer out a perfect death metal album that combines straight-to-the-point songwriting with technical prowess. Time to fly high again with Left Hand Pass. Left Hand Pass is available for pre-order HERE.